Hotel photos from Walt Disney World, Disneyland, and other Disney theme parks around the world. Photos include Disney's Polynesian Resort, Disney's Contemporary Resort, Disney's Port Orleans Resort, and many, many more! For everything you need to plan your trip, visit our Walt Disney World Trip Planning Guide. For thousands of additional photos and commentary from our Walt Disney World vacations, check out our Disney Trip Reports! 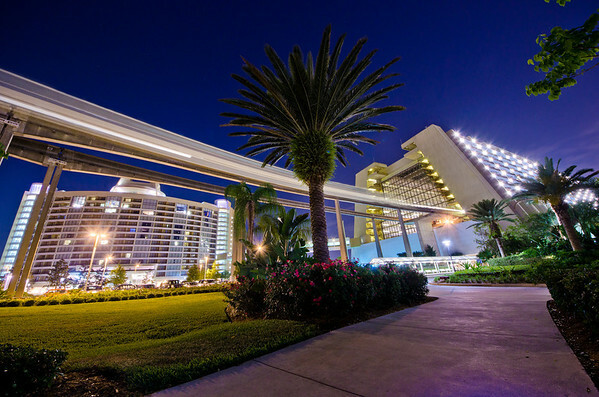 The Walt Disney World Monorail whooshes past Bay Lake Tower and into Disney's Contemporary Resort in this wide angle photo.